Guess we'll have to get rid of all those laws that trace back to Thou Shalt Not Steal, Thou Shalt Not Kill, and Thou Shalt Not Bear False Witness Against Thy Neighbor. As well as the entire concept of the rule of law and rejection of kings (Hebrew concept that the Founders directly honored). Not all religion is bad. Good luck separating the "GOOD" religions from the "BAD". By the way, this is a Yeats quote that I thought was provocative and might inspire sharp commentary. Arguing with Yeats might be a tad difficult. Intolerance is a fundamental human flaw rooted in (1) noticeable differences & (2) the propensity to esteem one's self at the expense of another. As long as people are heterogeneous & ignorance persists, intolerance will flourish (both religious & secular). Examples of religious intolerance abound--as do examples of secular intolerance. The body count in the 20th century seems to lean towards the secular variety by somewhere between 80 million & 130 million. 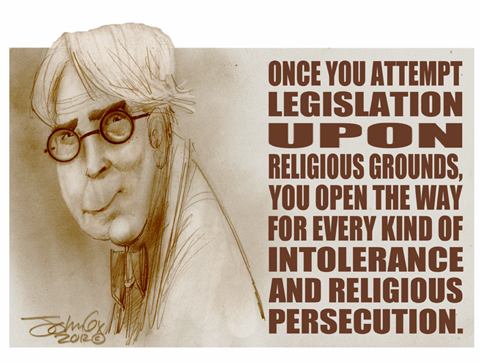 ANY legislation that favors one group over another opens the way for overwhelming intolerance & persecution, religion or no (or secular religion--faith in the State; probably more so). I think T could give Yeats a run for his money. I think "religion" is perhaps the most politically charged and least meaningful word available to us. Even the massive devastations by secular atheists have been oddly categorized under "religion", notably in moral polemics against religion. So does "religion" simply mean "imposing more than is moral to impose"? Could John have equivalently said, `Good luck separating "GOOD" from "BAD"`, irrespective of "religion"? The heart of the question, which T approaches as generally as feasible, is what should the government coerce and what should it tolerate? Mutual defense? Education? Poverty? Healthcare? Marriage? This is a very different question from what individuals or even a community should tolerate without government coercion. To relate it back to religion, does Christianity advocate that the government or individuals care for the poor? The moral I rely upon is to maximize liberty (and thus tolerance) at the highest level (e.g. federal). In the context of the gay chickens thread, which this thread might generalize, it suggests that we first answer the question of why marriage must be dictated by the federal government in the first place. Well put. I wouldn't even try to broach the issue of religion at this level here. DICENTRA has a valid point, but there are numerous books on the subject that, IMHO, all fall short of making a sound case. JOHN has an equally valid point--but the more confounding problem is ferreting out all of the bad religion within any given religion (doctrine might be a better word here). I would assert that the coercive force of government (given the assumption that government is "necessary" to prevent anomy--a point which I do not concede) should be limited to restraining those who would violate the liberty of others, & setting & carrying out punishments severe enough to deter such infractions from happening (or happening again). I have lots more I'd like to say, but maybe in another forum. Someday. T, I actually think you broached religion as well as can be. People talk past each other so often with it that the word itself seems as inarticulate as a swear word to me. That's why I think dicentra focused on specifics of Judeo-Christianity, and John on the good and bad under broader banners, and both of them are right, as you note. Your assertion works without your parenthetical assumption, doesn't it? I agree that anomy should not be the government's responsibility. US Founders seemed to believe that as well, even as they acknowledged the danger of a sick culture. Ok, I'll step in it here. Not enough time to get this well thought out, but will throw it over the wall. One conundrum is that societies need some moral and ethical consensus along with coded law to ensure that people, their property and their rights are protected from others. Even though there are lots of different religions and hundreds of sects and denominations, all of which have their own moral and ethical policies or values, societies do reach some consensus and codify it in law and in practice. The USA was founded on the general freedom of religious practice (within some limitations - example is polygamy has been banned), precisely to prevent government sponsoring or pushing an individual religion. That helps with Yeat's concern. Yet, the founders and others throughout our history have relied on the moral, ethics and values of individuals who practiced religion. That seems after 200+ years to have been a remarkably astute and practical approach. What seems to be a relatively new wrench in the gears of American society is what to do with a religion that has an extremist sect that viciously wants to eliminate the other religions by deadly force, with far greater numbers desiring to establish their own legal system contrary to the existing US legal system and wants to eventually institute a theocracy of intolerance, ruthlessness and minimal freedom. So what do we do with radical and fundamentalist Islam? This page contains a single entry from the blog posted on July 24, 2012 12:09 AM.